We hope to see you all at the sale, but if you are unable to make it or if you should have any questions, please do not hesitate to contact Charles or Michael. In order to make things easier, videos will be available to view online. 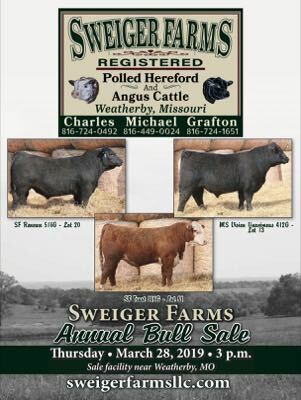 Bulls will also be available for viewing the Saturday before the sale. As always you are welcome to come early the day of the sale to view the cattle. Lunch will be provided the day of the sale. Again, we appreciate the confidence you have shown in us and look forward to seeing everyone on March 28th. Open House on Saturday, March 23rd to view bulls and ask questions prior to sale! Directions: 5 miles east of Maysville on Hwy 6 to "D", then 5 miles North Or I-35 to Maysville exit, West on Hwy 6 to "D", then 5 miles North Or 5 miles East of Fairport on "E" to "D"